It's Broadway in Reefton, the new, booming 1870s gold town. Suspiciously, Gordon Trembath, a naive young police constable, has been left in charge over Christmas and New Year. He is immediately faced with investigating a murder carried out by sly-groggers in the valley. In the meantime, the town has been invaded by "a collection of scamps, card sharps, liars and cheats, who have come to town for the pickings available in the holiday season". Among them is Duke Dixon, a Yankee con-man and gambler determined to carry out a swindle to empty the pockets and bags of gold of the unsuspecting citizens of Reefton. How will the young policeman deal with so many problems - including more murders - in this story of the gold rush frontier. 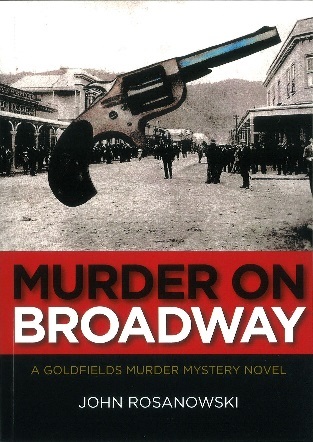 Murder on Broadway is a rollicking wild West Coast goldfields tale of murder and mayhem. When the obnoxious Reefton Police Sergeant Mackworth Snyder leaves Reefton in the hands of his new Constable Gordon Trembath, in the days leading up to the 1877/78 festive season, the reader just knows the hapless cop is going to have to deal with serious goings on. Fortunately, Trembath has the “town idiot”, Abe, to watch his back, along with Abe’s friend, the town drunk, Little Jimmy. The refrain “he said it would be quiet over Christmas” is used to good effect, as the plans for thievery, swindlery, sly-groggery and all sorts of other nefarious business are being made in Reefton and abroad. The main target for most of this activity is the annual Reefton Boxing Day Race Meeting, and tensions rise as the reader becomes aware of various scams being set up. The picture of the times is drawn as a slice of history that was part of the international wave of gold rushes: California, Ballarat, Otago, the West Coast. And the narrative is flecked with mentions of real historical figures such as Bully Hayes. And Abe’s friend Little Jimmy also features in Rosanowski’s novel Treachery Road, set 10 years earlier, about the Maungatapu murders. But knowing about historical figures or the history of the West Coast goldfields is not required to enjoy this book. All the characters are given robust backgrounds, and you get the feel of the muddy turbulent mess of the bustling goldfields service towns, with their mix of hardworking people hoping for a break, petty scoundrels, total blackguards, and entertainers. And you also get a feel of the surrounding bush, in a time when the now declining bush robins would flutter around you as you walked.